You need a good hearty breakfast before a day of sightseeing in Edinburgh. A number of hotels offer room only deals so maybe try somewhere different each day of your stay for breakfast. The go to place at the moment is Loudons at Fountainbridge, most mornings there is a queue for tables, but don’t be put off. They have just announced a new premises to open soon just off the Canongate, lower half of the Royal Mile, near New Street. If you don’t want to queue right across the road from the Fountainbridge Loudons is Akva which offers breakfast and in the warmer weather has a lovely outdoor area overlooking the Union canal. This canal links Edinburgh and Glasgow via the Forth and Clyde canal. So after breakfast you could walk or cycle all the way to Glasgow but at 35 miles in length maybe a 2 mile walk to the Longstone viaduct maybe more realistic. If a vegan or vegetarian breakfast is high on your list then Hula at bottom of Victoria St is the place to go with a good breakfast range and nice selection of smoothies. If your stay is over the weekend then after breakfast you can have a look round the market stalls set up every Saturday in the Grassmarket. For that old American diner experience that has a good selection of Scottish breakfast fayre head to the City Café in Blair St. Same street as the offices of Mercat tours so you could maybe combine breakfast with a Historical city underground tour straight afterwards. 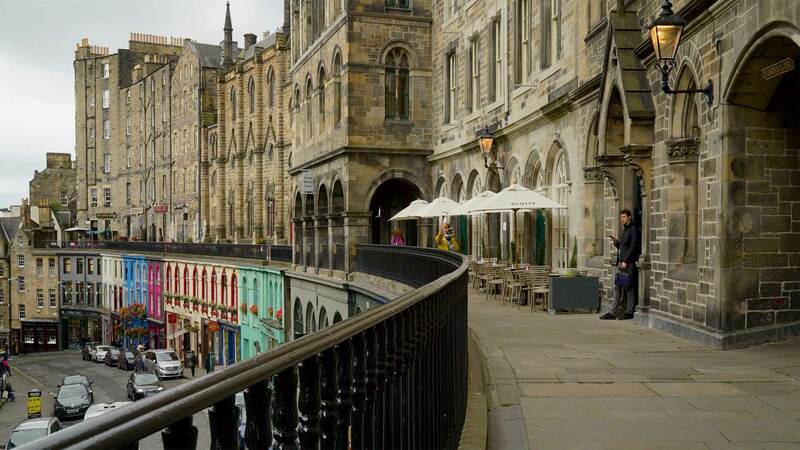 Sunday in Edinburgh, then suggest a trip down to Stockbridge for breakfast. You can then visit the small but perfectly formed farmers market at Hamilton Place. Stockbridge has a number of great spots for breakfast from Hamilton’s in Hamilton place very popular with locals and dog walkers to Artisan Roast Stockbridge if coffee is the most important thing to you first thing in the morning. Other places to consider are the Pantry, Cowan & Sons (no website)or No.33. Places in town for breakfast, Urban Angel in Hanover St, Wellington café on George St does great scones topped with cheese and bacon, although it is small venue better for a quick bite. Burr& Co George St offer good coffee and simple filled rolls but with locally sourced bacon or eggs. Henderson’s is great vegetarian option in town on Hanover street bit of an institution having been open since 1962. Normally wouldn’t point people in the direction of chains but popular with locals is Dishoom, India chain, offer a great breakfast selection in St Andrews Square. Also Wetherspoon pubs, either Standing Order in George St or Caley Cinema on Lothian Road offer budget breakfast in very interesting buildings. New kid on the block is the Lookout restaurant on Carlton hill they offer a continental breakfast and as the name suggests you get great views over the city. However there is a bit of a walk to the restaurant from the main road so I suggest you reserve a table to avoid disappointment. Most good places for Breakfast on the Royal Mile are actually just off it. 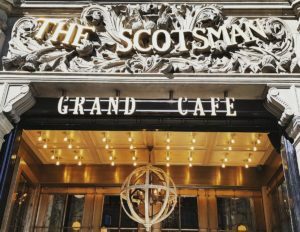 Grand Café part of the old Scotsman newspaper building is very grand indeed and have a great breakfast/brunch menu. The Edinburgh Larder in Blackfriars street use locally sourced produce and take a great pride in what they serve. Scott’s Kitchen on Victoria Terrace is in an out of the way location with lovely views over Victoria Street below. At top of Leith walk is Valvona & Crolla established 1934 a great Italian Del with a cafe through the back. Broughton Street also has a good selection of bars and cafes for breakfast. Should you be staying in an apartment while in Edinburgh, Crombie the butchers in Broughton St have a great selection of sausages to try. 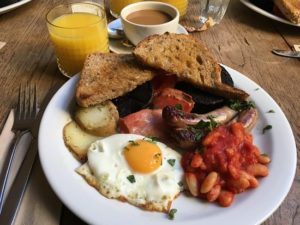 If your accommodation is near Tollcross, Bruntsfield or Morningside then look out for The Blackbird, Honeycomb or Rocket cafe are good spots to start the day. In Leith the Rose Leaf pub for brunch from 10am is worth finding as it’s in the back streets, but has a great atmosphere no matter the time of day you go in. On Saturday there is a small farmers market a few minutes walk form rose leaf. These are just a few suggestions but please be on the lookout for cafes near you as you may pas one or two excellent venues while walking to ones I have recommended.